Candidate Stephen Broden is in a very close race with liberal incumbent Eddie Bernice Johnson. If you live in Dallas, please vote for Stephen Broden. If you do not live in Dallas, please still help spread the information about his campaign! Click here for Early Voting locations. Faith: I firmly believe that our nation was founded on Judeo-Christian principles. These principles are the bedrock of our success as a nation and as a people. Family: Our nation's future is only as good as the health of the family. As the family goes, so goes the nation. Country: America has been a global leader for all freedom loving people. Our liberties and form of government is a model for all who strive for freedom anywhere. Our Declaration of Independence and our Constitution are among our most precious national treasures, and the ideas they embody must be honored. My beliefs are best expressed in the following statements: I believe in God and that He is the Sovereign Creator of Life and that America cannot exist without His guidance and blessings. I will hold to and protect the principles of our founding documents: The Declaration of Independence, The Constitution and The Bill of Rights. I will protect the national security of our country through ensuring funding of a well-trained military force and the technologies necessary to meet current and future military needs. I will support the funding of resources for military families to ensure that they have all they need to build strong and healthy families. The government should be restrained from regulating the lives of American citizens beyond that which is necessary to ensure Constitutionally based ordered liberty, and I will promote the principles of small government. I will promote and practice fiscal responsibility. It is the responsibility of the federal government to secure the border to protect our sovereignty and our safety. Laws that prohibit employers from hiring persons who entered the country illegally should be strictly enforced. Federal law should work to help those present in America who entered the country illegally to be considered for citizenship via a pathway that does not reward their having entered illegally or let them jump to the head of the line. The law must reward those who pursue the legal path to citizenship. We are a nation of immigrants whose forefathers recognized America's greatness. Our immigration policy and requirements must be focused first and foremost on immigrants who desire to be citizens, and then on those who desire to work here legally. Our laws must be designed to turn immigrants into citizens who understand, love and embrace America's greatness, and respect its laws. The unborn are included in the rights given to us by our Creator as memorialized in the Declaration of Independence-the rights to life, liberty, and the pursuit of happiness--and that those rights are protected under the 9th Amendment to the Constitution. I will protect the life of the unborn. I believe in and will protect the institution of marriage as the legal union between a man and a woman. Churches and other pro-life agencies should provide counseling services to all post-abortive women, because abortion is a trauma with lifelong consequences for many women. I am running for Congress because of my deep concern over the direction our country is taking — away from the conservative Constitutional founding principles which made this nation great, and rapidly toward Western European socialism — which will make us weaker, less prosperous, less safe and less free. We cannot allow two more years of Nancy Pelosi as Speaker of the House or irreparable harm will be done to our country. I am the first conservative candidate from the 30th District who can actually defeat the incumbent, and she must be defeated this year. I will do so! With regard to the issues, I want to stop the tyranny of the liberal-progressive majority in Washington D.C. Individual issues in the traditional sense, while important (because they are where votes in Congress play out), are not at the core my candidacy; nor are they as telling as one’s fundamental values and beliefs. My candidacy is about conservative, Constitutional principles of limited government, free enterprise, individual responsibility, personal freedom and national security. Because my guiding principle, my stand on individual issues will be correct. Every vote, on every issue, must be weighed against the unchanging original intent of the framers of our Constitution with respect to the limited role of our federal government. To do this, I need help. Your help in volunteering your time and efforts to the campaign would be deeply appreciated. Stephen Broden has deep roots in District 30, and has lived in the Dallas area for over 30 years. He is an outspoken advocate in the Fair Park and South Dallas areas for economic opportunity, quality education, and respect for life. He is a frequent speaker at Tea Party Rallies advocating a return to Constitutional principles in government and a respect for the Judeo-Christian values underlying the founding of our nation. He supports the Second Amendment right to bear arms and the Tenth Amendment respect for states' rights. Stephen Broden founded the Fair Park Bible Fellowship Church in 1987, and continues serving that community-based church today as Senior Pastor. He also serves as President of the Fair Park Friendship Center which is a community-centered gathering place for groups such as the Boy Scouts and the Girls' Club, and also is a community resource center offering hands-on assistance to surrounding area families. The Friendship Center offers a variety of practical services including a clothing store and back-to-school rally where children from neighborhood families are provided with donated school supplies. Family counseling and other programs are also offered through the Friendship Center, which has served its community by offering family-supporting services for the last twenty-two years. 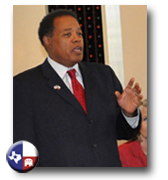 Pastor Broden has been actively involved in the pro-life movement since 1983 and is the chief spokesperson for the black pro-life movement in Dallas. Stephen's business background includes ten years in the private sector at Atlantic-Richfield Company in Human Resources. He has been a business owner of several self-serve car-wash facilities, and has also worked as a newscaster, disc jockey and radio broadcaster. Currently he works as a co-host on a radio talk show on KSKY, 660 AM, Life and Liberty, and as a radio broadcaster of One-Minute "thought of the day" commentaries on that station. Stephen Broden graduated from the University of Michigan with a Bachelor and then a Master of Arts degree in Communication, and later studied at the Dallas Theological Seminary where he received a Master of Arts in Bible Studies. Stephen is married to Donna W. Broden, and they have three children, Jamaal 29, Maia 27, and Stephenie 22. Is a founder of Ebony Berean, an organization with a mission to inform African-American Pastors of the "Cultural Wars." Follow Stephen Broden on Facebook and Twitter.